1¼" wide x 3⅜" long This fun cupcake kit comes with a sticker set to enable you to create a series of hilarious faces on your cake toppers. Complemented with 2 styles of cupcake papers, a great way to decorate your baking sensations. Package contains 24 cupcake papers in 2 styles, 24 blank face toppers, and 6 sheets of stickers. This fun cupcake kit comes with a sticker set to enable you to create a series of hilarious faces on your cake toppers. Complemented with 2 styles of cupcake papers, a great way to decorate your baking sensations. 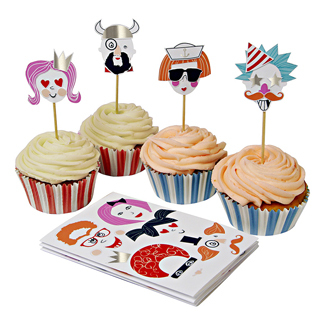 Package contains 24 cupcake papers in 2 styles, 24 blank face toppers, and 6 sheets of stickers.